Updated: T-Mobile, Verizon and Unlocked Galaxy S8 and Note 8 variants are now receiving Android 9 Pie OTA update in the USA based on One UI. See how to download the full stock firmware from below. Snapdragon Galaxy S8, S8 Plus and the Note 8 are the latest Samsung devices receiving official Android 9 Pie OTA update. Sprint carrier has stepped into the update game and has become one of the first network carriers to roll out One UI for the previous generation devices in the USA. The global variants of Galaxy S8 and Note 8 are already running the latest firmware upgrade. It becomes clear that more carriers such as T-Mobile, AT&T, Verizon will soon release One UI in the United States. So download and install the latest Android 9 Pie for the Sprint Galaxy S8, S8+, and Note 8. As for the updates, the Samsung Galaxy S8 (SM-G950U) and S8 Plus (SM-G955U) receive latest firmware build numbers G950USQU5DSC1 and G955USQU5DSC1 respectively. Same goes for the Galaxy Note 8 with build N950USQU5DSC1. Most importantly, the software also packs the latest March 2019 security patch level. This security patch isn’t even available for the international variants of the phones. One UI has become quite popular right after Samsung announced it. The main features about Samsung’s new user interface is it is now more stable, smoother, battery optimized and suitable for one hand operations too. So if you are on Sprint network in the USA and would like to download the latest Android 9 OTA update, then go to Settings > System Updates > and Download OTA updates manually. Here is the update for the Galaxy Note 8 Sprint carrier. Alternatively, if you still haven’t received the OTA update yet, then you can simply download the full stock Odin firmware file from below and flash it using Odin FlashTool. This will also factory reset your device and install a fresh copy of the latest software. 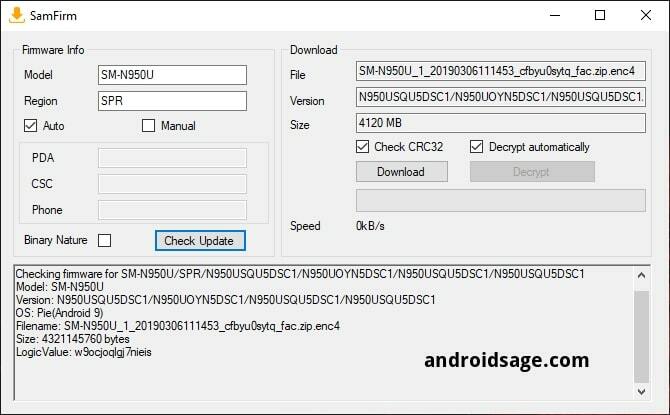 Here we will show you how to download the full stock firmware update zip using SamFirm tool (Samsung Firmware downloader). This tool is free and has no restrictions of download speed, unlike many other paid websites. We have also listed the complete detailed installation tutorial for using Odin FlashTool. So what are you waiting for? Download and extract the latest Samsung Firmware download tool to PC (Windows). The tutorial has detailed steps for download Samsung Firmware for all. Also, not down the CSC code or Product code for your specific region. See the list of CSC codes for all of your Samsung device region. Here we have selected SPR for Sprint and TMB for T-Mobile. Now, launch the SamFirm tool with admin rights. Download the latest stock firmware for Galaxy S8. Next Entry Oxygen OS 9.0 for OnePlus 3 and 3T based on Android 9 Pie leaked (Closed Beta) – OTA Downloads available!